The Differentials are a very strong aspect of UK Horse Racing's Ratings. Differentials indicate whether a horse is rising or falling in either weight or class. The more a horse drops in class, or weight, the greater the positive differential. The more a horse rises in class, or weight, the differential becomes more and more negative. This is because a horse whose class differential is positive is deemed to be running in a lower class race than before and, thus, this is seen as a positive. A horse going up in class, to face a tougher set of opponents, is going to have a negative differential. The same applies to a horse given more weight to carry. In this situation the weight is lower than what its had to carry in the past so this advantageous situation gives it a positive weight differential. A horse lumbered with more weight is going to have a negative differential." Like most of the UK Horse Racing ratings, the guideline is quite simply Bigger Is Better. The mathematics behind the Differentials is ever so simple. All one does is to compare the Race Class against what the horse has run in before. This equally applies to calculating the Weight Differential, but for this example we're looking at the Class Differential. Do note, though, that Race Class is a figure describing the quality of the race's entrants by UK Horse Racing, rather than the figure given by the British Horseracing Authority (BHA). If a horse is entered, say, in a Hurdle race which we rate as Race Class of 100 and the horse has run in previous hurdles rated 102, 104 and 108 then it's clear that the horse is dropping in class. This is the essense of the Class Differential figure. In this example the average of the Race Class figures is calculated, which here would be 104.67 and subtracting today's Race Class of 100 we end up with 4.67. Any horse which is falling in average Race Class, as in the above example, is said to have a positive Class Differential, whilst a horse running in a race whose Race Class is higher than the average of its previous races is said to be having a negative Class Differential. Or to put it another way, as we've said earlier: Bigger is Better. Where Is The Data Found? Each race that is run is given a Race Class figure. This figure can be seen on the top of every race's rating and within the Daily CSV file. In the CSV file it's the fourth column, Column D.
This illustration of both the PDF file and the CSV may help. 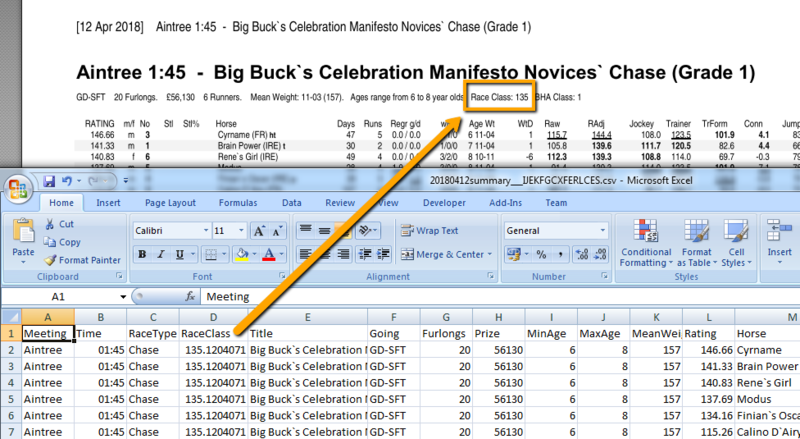 This screenshot is straightforward enough and shows quite clearly where one can read the Class value of the race. For those who don't know how UKHR works, the Class value is determined by the strength of the a horses within a race. Therefore, if a race contains a number of good horses then the Class value for that race is going to be bigger than that of a race with a poorer collection of horses. 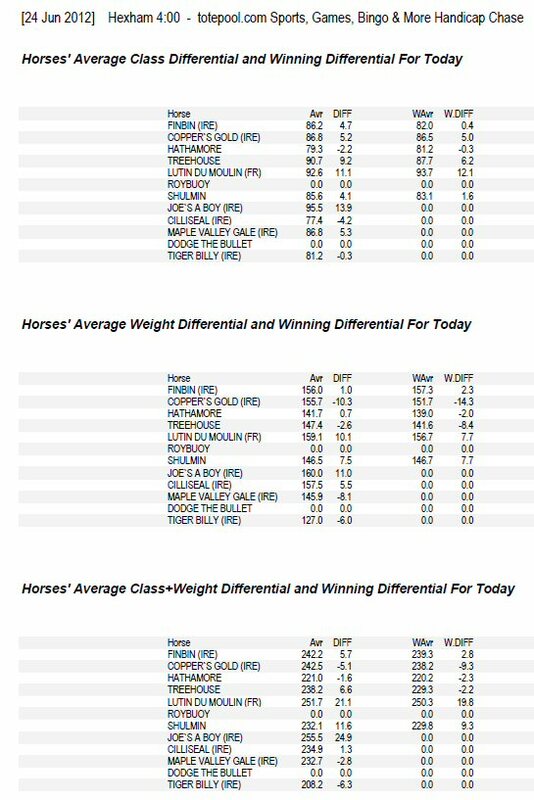 Of course, a horse with an positive Class Differential or, indeed, a positive Weight Differential need not always suggest a good thing. The principle of a horse with a good solid positive Differential is a sound one. But do also consider that the horse may be utterly useless and is simply being handicapped with a lower and lower figure and is falling through race classes and weights in the vain hope that the thing may actually win a race one day. Some horses simply get 'past it' and just won't win ever again, even though the Differentials look fantastic. This section was added on the 11th May 2013. When this page was initially written the time interval inspected for every horse was five years. So, if a horse runs today then the Class Differential is calculated from its run over the past five years. Since then a request has been made that we ought to also make the data avaiable for the class differentials for over the past year. The idea being that we can see if a horse suddenly goes up or down in weight or class significantly. The Five Year Class Differential is still known on the forums and on the rest of the site as "The Class Differential" but it ought to be remembered that when 'Class Differential' is discussed it's the Class Differential over five years. Anything which is calculated over one year will be explicitly defined as so. In the daily CSV files and also in the Archive CSV files the Five Year Differentials are listed in Columns EL to FI, whilst the One Year Differentials are in Columns FV to GS. There are other Differentials which can be used; the obvious one being the Weight Differential. This compares the average weight that the horse has carried in the past compared to today. This is a good way to see, at a glance, how much extra weight is being carried and when one compares this with the Class Differential sometimes one can see one rise whilst the other falls. But sometimes when they both rise or both fall there's a good opportunity in either backing or laying. And that's not the end of it. There are two more Differentials to consider. These compare today's Class (or Weight) figure with all the races in the past, as before, but only those where the horse has won. These Win Class Differentials are therefore different but it may help to indicate if a horse is within a previous winning capability. And, of course, we have the Win Weight Differentials too. That's not as far as we can go. We can even look to see how the sum of the Class Differential and the Weight Differential. If both are positive, then we should really be looking at this horse for backing opportunities, and if both are negative we ought to look to see if the horse can be laid. Using the Data Analysis Tool it is clear that the Class Differential does give a strong positive or negative indication to a horse's chances. It is to be remembered that all the Differentials show is that we have a horse which is running out of its previous Class or Weight bands. It doesn't necessarily mean that the horse will win, or lose, but it does give a strong indication that a horse is to be more, or less, fancied. Because at UK Horse Racing we consider Race Class in a totally different way, arguably superior way, to almost everyone we can see horses which are rising or falling in Class when others cannot. Of course, we can't see a horse's change in weight in a different way but we can see Class in both a different and better light. We have seen horses coming from, for example, a BHA-rated Class 2 race into a BHA-rated Class 3 race and still, as far as we are concerned, the horse may be actually rising in class. More information on using the Differentials can be seen here on the Reading The Ratings page. Let's look at a simple example. Below is a part of a Data Analysis run of horses which have run on the Flat, in Great Britain, from 2008 to mid-2012. All of these are running in what we have as good stalls bias (our 10% Stalls Bias indicator). This starts off rather well and is saying that every horse ran on the British Flat with a good stalls bias were to be followed then after just over 19,000 runs we'd have a profit of 469 points after having a strike rate of 11.2%. Do bear in mind that this is a real return price as it takes into account a Betfair commission of 4.8%. That's all well and good, but look at the row with the Class Diff. < 0. Here we're looking at horses which have been raised into a higher class than they, on average, normally run. Out of the original 19,400 runners we see that there are 8,657 of these which are running in a higher class race. How do these fare? Not very well, as it happens. The strike rate is about the same, a little lower, but the they make a small loss. That's having over eight and half thousand bets which are doing nothing except giving the exchanges commission fees. This simple example shows how by excluding Negative Class Differentials we are improving our backing. Here's another example, this time we're looking at the Tony-1 Backs. Tony was a member who proposed a backing system which was later named after him. However, the one drawback that it had was that it ran to an overall loss if left alone. However, if one restricted these selections to those only where the Class Differential was postive then something extra-ordinary happens. 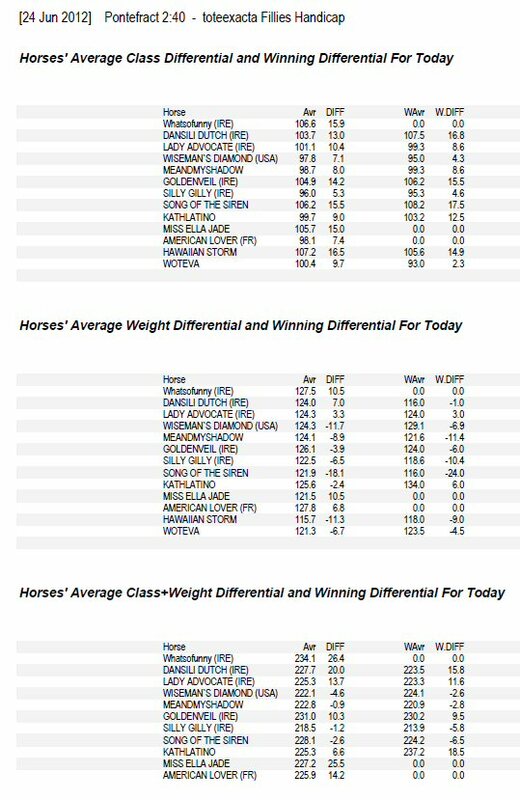 We see that by only selecting horses which are running in a lower average class, in other words, having a Positive Class Differential then we've turned a 319 point loss into a 297 point gain. This is a turnaround of 600 points by simply chosing horses with a Positive Class Differential. There is something which we have termed, perhaps flippantly, "Blindingly Obvious Selections". Have a look at this extract from the Hexham 4.00 race (June 24th, 2012) to the right. This example is one of many that I could have selected, but at the time of writing this was one of the more recent ones noted. On the same day there was another Blindinly Obvious Selection; this time in the 2.40 Pontefract. For this example we're looking at Page 25 which is reproduced here to the left.